Preparing a home for sale can make the difference in market time, price offered, and overall satisfaction of your performance as an agent. This task is too important to take lightly or to leave up to the sellers. Your goal is to prepare a listing so that potential buyers create an emotional connection to it. 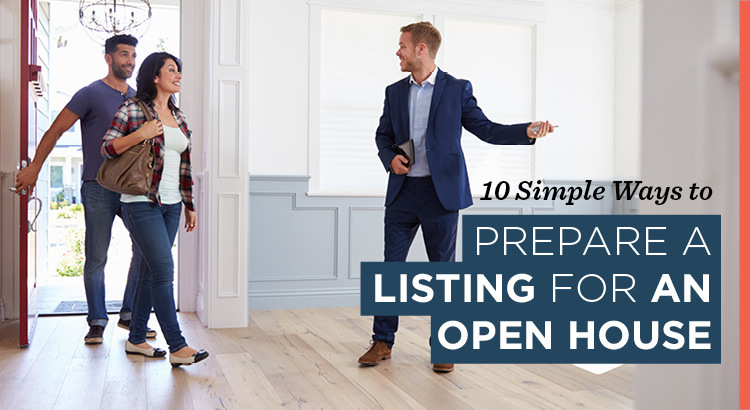 In this blog post, we’ll cover 10 simple ways to prepare a listing for an open house. The first step in preparing a listing for market is to advise the owners on how to clean and reorganize so that they make sure the home looks its best. Eliminate clutter and storing personal items will help you make an impression with potential buyers. Your sellers will need to be on board with these recommended changes. The home may need paint, repairs and additional staging. Even rearranging or removing some of the home’s furniture can make a big difference. Sellers have to understand that an attractive presentation means the home will sell faster and for more money. Walk through new construction model homes to get ideas. Here are 10 affordable and easy steps every agent can accomplish before a showing. Clean the house from top to bottom. Wash baseboards, nooks and crannies to make everything look fresh and new. Change out light bulbs, make them match and dust them off. Keep all lights on during showings, including closets and under-cabinet lighting. Remove clutter, including personal items and furniture that make rooms seem smaller. Patch and paint all cracks and holes in the walls. Get rid of outdated or strong colors and go for neutral paint. Curb appeal is paramount. Clean outdoor areas of debris from last season and store any decorations. Remove curtains and other obstructions to let as much light in as possible. Remove seasonal clothing from closets to show more space. Make sure all the hangers match. Closets and storage space should look as large as possible. Scour shower doors, change toilet seats and clean out drains. Clean out and dust all vents. Add healthy, robust potted plants – take out the fakes. Once you’ve completed these steps and given the home a makeover, you’ll notice a big improvement – and your potential buyers will, too. To learn more about how to prepare a listing for an open house, click here to watch the two-part course and start your seven-day free trial of AgentEDU today!